A young Spencer Tracy plays Dutch Miller, a highly arrogant, egotistical blow hard of a fisherman with the ability to lead men ever since he was a kid. He commemorates his marriage to the pretty cannery row beauty, Hattie (Jean Harlow) by quitting his job and encouraging his fellow fishermen to go out on strike. When the labor battle is lost, Dutch is tossed out as union President and with his oversized ego in hand, and no job, goes off leaving his wife and former friends to prove he can be a success. Later, Hattie learns the Dutchman is not doing well and is living in a hobo camp. She steals some money for him, but the ego driven Dutch refuses to accept her help or even see her. Hattie is soon caught for the thief and sent to prison. Pregnant with Dutch’s child on the way, Hattie escapes from prison. When Dutch learns about his child he has a sudden epiphany, coming to the realization being a good fisherman is good enough. He doesn’t have to conquer the world. 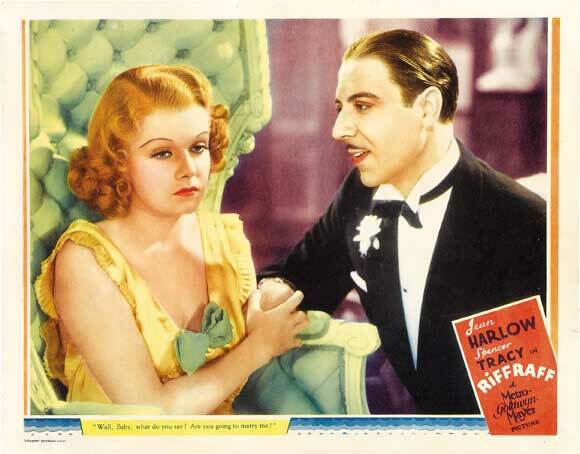 “Riffraff” is a paranoid piece of entertainment, written by Francis Marion, Anita Loos and H.W. Hanmann, based on a story by Marion. The film cannot make up its mind whether it wants to be a raucous waterfront comedy or a social drama dealing with issues of union labor, evil management and women behind bars. This is where the main problem with the film is, in the writing. Tracy’s character is not believable and his turn around at the end is just too quick and unconvincing. This was Harlow’s first non platinum blonde hair film and she looks great. It was a bit of a risk, the studio was concerned whether the public would like the sassy Harlow without her trademark tresses. Jean Harlow was always best as a comedic actress in films like “Libeled Lady,” “Bombshell” and “Red Headed Woman” (I never cared for her performance in Capra’s “Platinum Blonde”). As a dramatic actress, she left something to be desired. There is a strained effort in her performance here, at least in the latter more serious part of the film that is generally unconvincing. Harlow seems much more comfortable in the early, lighter segments of the film where she is battling with Tracy’s Dutch Miller, and fighting off waterfront boss, Nick (Joseph Calleia) who showers her with gifts and unwanted attention. One of the more interesting aspects of the film is the morality of Harlow’s character which took a dramatic hit with the enforcement of the Production Code. Though she dates Nick to make Dutch jealous, she constantly fights off his advances avoiding any sort hint of sexual intimacy, her virginity is never in question. When she and Tracy have a child, though she is in prison at the time, we know they are already a married couple. Harlow’s Hattie is also willingly goes back to prison to serve her time once she knows old Spence will take care of the baby. Unlike her earlier films, here morality remains intact; Harlow was always at her best when she was pre-code and a free spirit. Her characters, post code, are a pale comparison of her wilder women in films like “Hold Your Man” where she is sent to prison, pregnant and unmarried. Tracy’s Dutch, as mentioned, is an obnoxious blowhard; one has to wonder what it is exactly about him that has Hattie hooked on him. His ego is so hefty that during their wedding ceremony when someone tells him he’s a lucky man to have Hattie, his reply is she’s the lucky one to get a guy like him! 1936 was great year for Tracy. Two other films he made that year were “Fury” and “Libeled Lady.” “Fury” was Fritz Lang’s first American directorial effort, and one of the most notable films on the perils of mob rule. “Libeled Lady” is one of the great screwball comedies of the decade in which Tracy co-starred with William Powell, Myrna Loy and Jean Harlow. The studio’s big concern when the film was released was whether the audience would accept the platinum blonde with brown hair? They need not worried, the film received generally good reviews, despite an implausible ending, and was a hit with the audience when it opened at New York’s Capitol Theater in January of 1936. 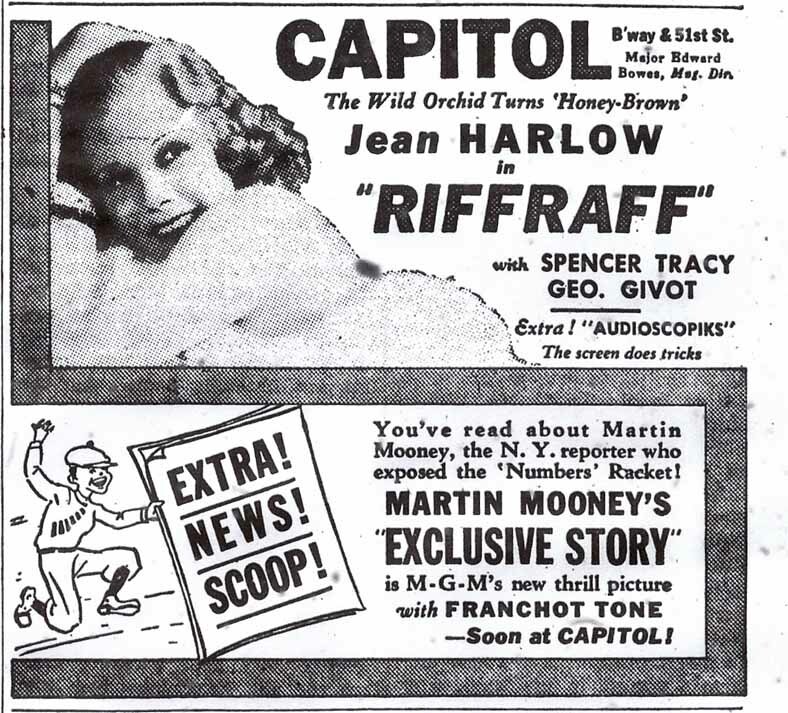 Sadly, less than two years after the making of “Riffraff,” Jean Harlow would be dead due to acute nephritis, a severe infection of the kidneys. Today this would most likely be cured with antibiotics or a transplant, neither of which were available back in those days. Jean Harlow was twenty-six. This entry was posted in 1930's, Film Reviews, Jean Harlow, Spencer Tracy and tagged J. Walter Ruben, Jean Harlow, Joseph Calleia, Mickey Rooney, Riffraff, Spencer Tracy, Una Merkel. I’ve never seen this, but Tracy’s Dutch sounds like a few other characters he played in his early years in Hollywood. For some reason, he played the part well. He does it well for sure, Tracy never gives a bad performance. However,I just don’t understand Hattie’s (Harlow) attraction to him. Why is she stuck on such a blowhard? John, although the movie RIFFRAFF may be so-so (never having seen it, I’ll take your word for it), but your review is an enjoyable, engrossing read, as always! It would certainly be interesting to see what the pre-Code version would have been like. Such a shame about Jean Harlow’s untimely death, especially since she and William Powell were going to be married. I had read rumors somewhere that Harlow’s mother allegedly made matters worse because she was a Christian Scientist and refused to call a doctor until it was too late. Powell had a tough time of it for a while, between grieving. Whatever the reason for Harlow’s death, it’s tragic that she left us so soon, even if she had a memorable body of work for us movie fans to remember her by. Dorian, sorry for the late response. My PC or rather verizon was acting up yesterday and I lost access for a while. Anyway , its always good to hear from you. It’s not a bad film, I just thought it was uneven and Tacy’s character was unlikeable which I think was a distraction. Harlow’s death was tragic, what was she 26? It seemed like a death that could have be avoided had the proper medical attention been there to help her. Very sad. With early deaths like Harlow, and say James Dean, I always wonder what great performances there may have been and will never know. I saw this one a couple of years back or so and think I liked it more than you did, John. I do agree it is uneven, but remember it as quite gritty and with a pre-Code feel at times, despite the fact that, as you say, there is quite a bit of content which is obviously added in because of the Code, making Harlow’s character far more moral than she would have been pre-1934! I rather liked seeing her in a melodrama although I agree with you that she is at her greatest in comedies like ‘Libeled Lady’, which I saw recently. I remember thinking that Tracy starts off as a comic bigheaded character, but then becomes more likeable/understandable later on as his insecurities are revealed – he does play a lot of arrogant characters in his films, but because he is such a great actor, there is a feeling of something more underneath, as with Cagney in similar roles. If I remember rightly, there is a devastating scene at the hobo camp where Tracy’s character is in tears talking about how he can’t overcome his drink problem, which of course was true for the actor in real life too. Another fine review with a lot of food for thought. That’s true about the hobo scene Judy, still I just find his turn around to a nice guy willing to take on a family way too much of a sudden change. The problem is not with Tracy, he great, it is with the script, at least for me it was. Despite these problems i did enjoy the film will and probably take another look at it some day. Thanks again for the geat post! As I was reading your review I realized I haven’t seen “Riffraff.” Thought I had. I enjoy Spencer Tracy in just about anything – as for Harlow, it depends on the picture – but this one definitely sounds worth watching. I liked the two together in “Libeled Lady” (what a cast!). I like “Platinum Blonde” very much – though not so much for Harlow’s character (which is OK, but that’s about all). I’m drawn to it as an early Capra/Riskin film – but more because of its star, Robert Williams (who was also a Broadway star). He might’ve had a Spencer Tracy (or Lee Tracy) sort of career had he not died suddenly, unexpectedly, just as the film went into release and became a hit. Eve, – I don’t think Spencer Tracy ever gave a bad performance. He was just a natural! I am with you on Harlow, it depends on the film. Given the right role, she is good but as an actress she had her limits. We, at least I am, are always left wondering what could have been with actors who died young like Robert Williams or Jean Harlow. There was so much more they could have given.